What does God want most from you? For too many believers, this question echoes troubling messages from the past. "Thou shalt not," "you need to do more," "why did you miss last nights meeting?" Its easy to feel overwhelmed, which can keep you from seeing what God truly desires to accomplish through you. If you are pulled in too many directions and distracted by the clamor of competing demands, let the author introduce you to the Christian life as Jesus designed it. No longer is it necessary to question what God wants most from you. You can set aside everything that is secondary in importance and devote yourself to just four callings. Now you can make the greatest impact possible in your world. STEVEN K. SCOTT is the bestselling author of The Greatest Words Ever Spoken, The Greatest Man Who Ever Lived, and The Richest Man Who Ever Lived. An entrepreneur whose start-up companies have achieved billions of dollars in sales, Scott learned the laws of success by studying the book of Proverbs. He is co-founder of Max International, Total Gym Fitness, and The American Telecast Corporation. In his speaking and teaching ministry, Scott emphasizes the unique role and miraculous power of Jesuss words in the lives of those who follow him. 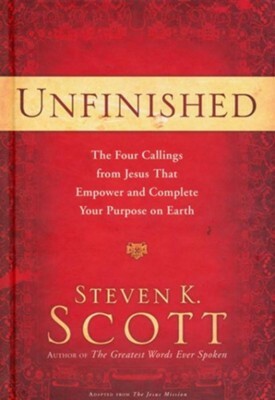 I'm the author/artist and I want to review Unfinished: The Four Callings of Jesus That Empower and Complete Your Purpose on Earth - eBook.